The most recent game I finished is a cute and heartwarming adventure called Tales of Hearts R (The R just means it is a remake of an existing game!). It’s a story about a young man who goes on a quest across the world to restore the shattered soul of the girl he loves, and along the way meets many friends, a few enemies, and somehow winds up saving the universe – as you do. It can also be read as a parable about the struggle to beat depression with the help and support of those around you, and ultimately the strength of the human spirit in overcoming obstacles both physical and mental. I’ve been super busy, so I didn’t have time to chart and stitch the logo I really wanted to, which is the crystal in the bottom of the picture below, on the game case. The flower here is sort of a visual representation of the character’s soul, and each petal is one of their personality traits. 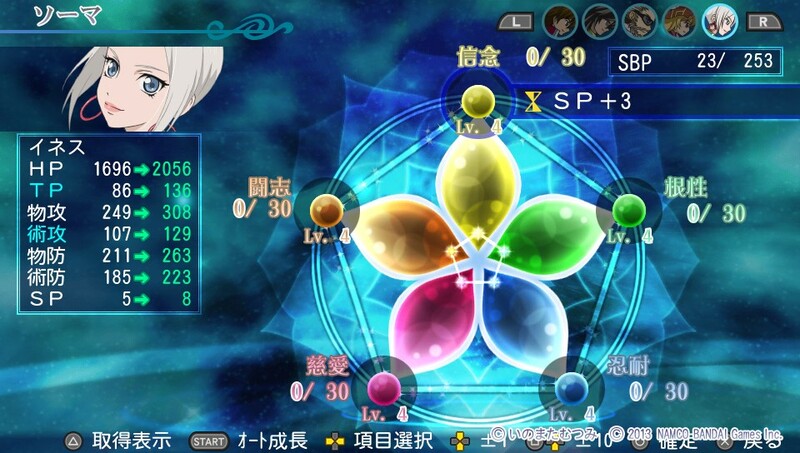 You can choose which traits you want that character to embody, and your choices are reflected in the flower. It also affects their performance in combat against the monsters that roam the world, with each personality trait directly influencing a combat ability. Cross stitch really isn’t the ideal medium to do these logos in as it is hard to get the level of detail in such a small design, but I’ve started the project that way and I feel weird about changing it up halfway through, so I will persevere. The point of these logos isn’t to be a detailed depiction of the game or even an accurate copy of anything in it, but to just be a quick visual reminder for me personally of something memorable from it. In a few months, at the end of the year, I will be gathering up these little stitches from each game I’ve completed in 2015 and making them into a little patchwork something or other – I haven’t actually decided yet between a pillow and a wall hanging! After last week’s foray into Christmassy, wintertime things, I’ve returned to the land of bright, Summery florals, just in time for the English weather to perk up once again and bring a last blast of warmth before Autumn sets in. I added some sequins and beads, because everything has to be as shiny as possible or I am dissatisfied. I also did NOT add enough wadding – as you can see, it’s not the most circular circle in the world! 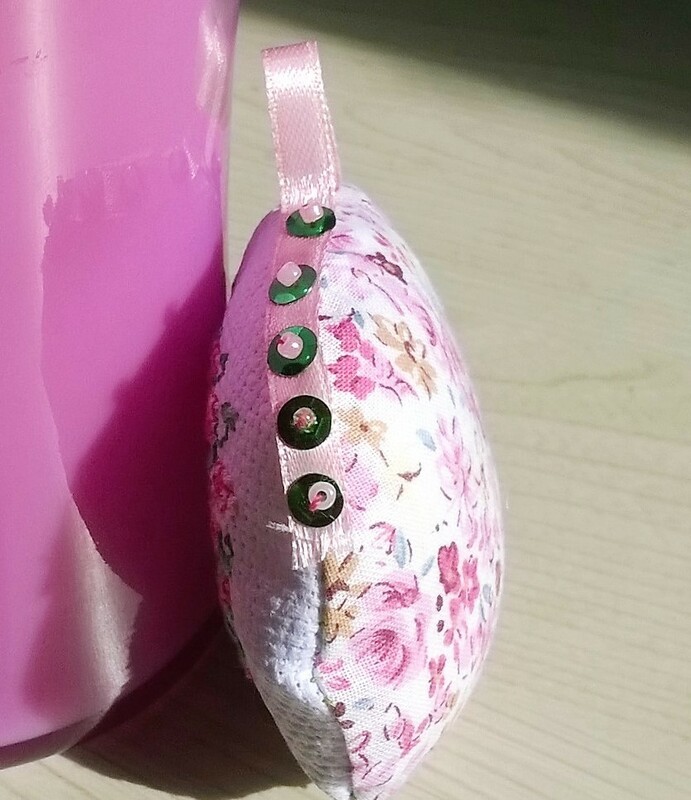 It doesn’t help that my sewing machine is AWOL being borrowed by a relative, so I stitched it together quite hurriedly by hand, but with the pretty backing fabric and the shiny sequins, I’m pleased with it nevertheless 😀 Now it can hang on an arm of my jewelry tree and keep all my earrings in nice neat pairs for me! 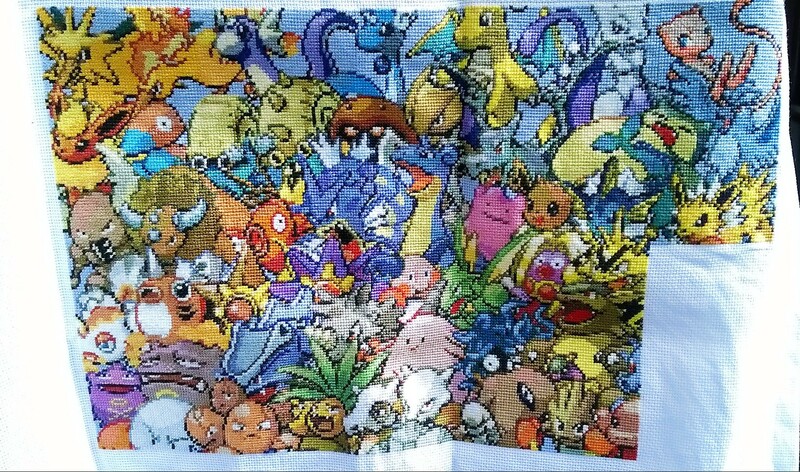 Page 9 of my mighty Pokemon picture is complete! Let me show it to you! 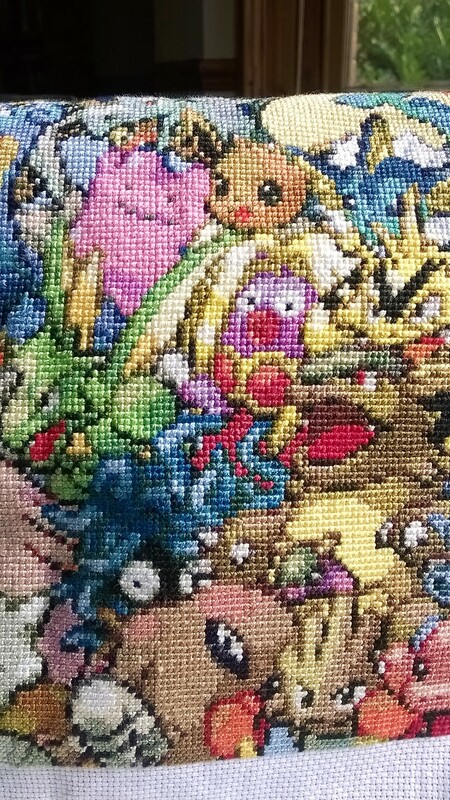 Pokemon Picture – Progress as of September 2015! I’m so pleased, it took me only just a little over a month to complete this page, and that was a month that included extra hours at work, as well as my first time managing my own project and staff! Cross stitch really is a godsend for me during stressful times such as these. 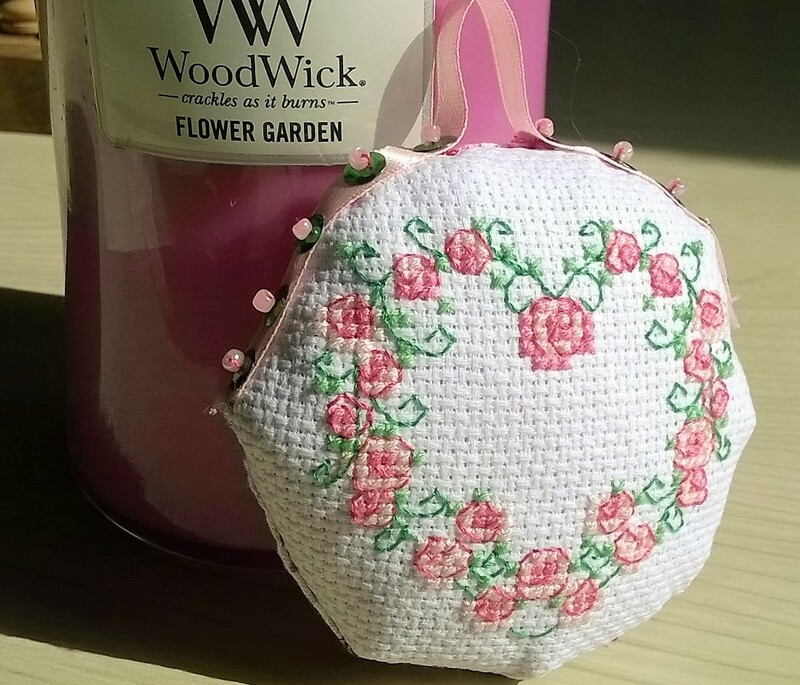 No matter what my day at work has been like, I feel totally relaxed after an hour of stitching with a big old cup of tea by my side – or a glass of wine in the event of a particularly rubbish day!